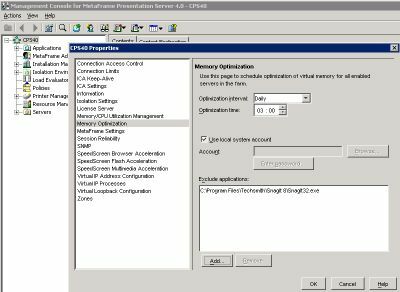 In Citrix Presentation Server 4 Citrix added CPU and Memory optimization to the Presentation Server product. These features were not developed by Citrix but licensed from RTO Software. Logically these components in CPS are just a subset of the features RTO offers in their own product. Within the Citrix Presentation Server console you can only enable or disable both features on farm level and server level. On farm level you specify the time the optimization job should be run and which applications you would like to exclude. 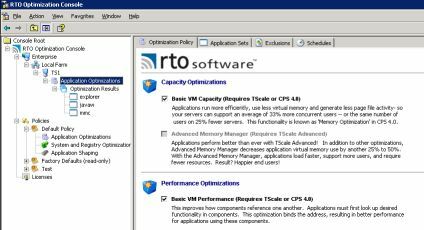 To give you more control over this features RTO released the Optimization Console, which is available for free (with a limitation of the usage and available options). The installation exists of a single MSI file. Besides the default question you need to specify a user account which has enough rights to access the server. After the installation no reboot is required, so we can just start the console. The Optimization Console is a MMC based console. With the freeware version of the console you can control only one machine (on which you installed the console). If you would like to control more servers out of one console and use the policies you need to purchase the Enterprise version. Also several options in the console are settings for the RTO software products TSScale and TSScal advanced and cannot be used with the CPS implementation. What is than the added value of the Console if you are using the Citrix features only? You can the optimization task directly from the console and a graphical window will be displayed with the current and possible savings. As already mentioned these tasks can be configured only for the local server you installed the software, so you should install the product on every server you would like to configure different than the farm configuration. The freeware product will be installed with an evaluation version of the Enterprise product, so you can test those features (accidently). Beside that you can use the console for more server you can assign a policy to the machine. A policy is a preconfigured set of the above mentioned settings, so you do not have to configure them manually on every server. Logical you can create several policies, where on one server one policy can be applied. The freeware edition of the Optimization Console is limited for practical usage. The use the software in the freeware version it must be installed locally on each server. Because there is no possibility to export the configuration, you should set the configuration manually on every server. The tool is useful in your infrastructure if you have a few servers that need a separate exclusion list or if you would like to have more optimization jobs per server or different times to run these jobs. Also during development or testing the graphical interface of the memory saving can be helpful. The paid Enterprise version adds a central console for your servers and the possibility to use templates for configuration for the servers. The other options can only be used if you using RTO's own product TSScale.